Built over a two year period, the new Parliament of Victoria Member’s Annexe is providing much-needed office space to the members of the Victorian Parliament. The consequences of air leakage can include a reduction in delivered air flow; thermal losses due to air leaking between conditioned and unconditioned areas; and an increase in power consumption due to the additional capacity required to correct losses due to air leakage. Aviator Intelligent Ventilation Control systems use the latest digital technology to manage as few as one fan, or up to a large system of multiple fans and sensors for almost any ventilation application. 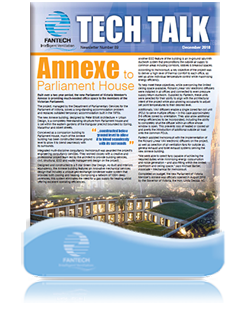 Please login to view the latest TechTalk newsletter. The new Perth Stadium (known as Optus Stadium) is a 60,000 seat, world-class multi-purpose stadium designed to host a variety of sport and entertainment events including AFL, cricket, rugby codes, soccer and concerts. Recently, the Standard relating to kitchen exhaust fan casings and cowls for commercial buildings was updated. As there has been some confusion regarding Section 6.2 of AS/NZS 1668.1 2015, Fantech has sought an interpretation from the committee responsible for this Standard. Increasingly, architects and builders of residential apartments, hotels and commercial properties are seeking ways to lower construction costs by reducing the size of ceiling voids and therefore minimise the overall building height. Following almost four years under construction, the Queensland Government’s new $1.8 billion Sunshine Coast University Hospital officially opened to the public in April 2017. The AirLink Integrated Variable Air Volume (VAV) system is the next step in efficient HVAC system design. This modern system is based on electronic VAV diffusers working with an even pressure duct design. The system removes the need for air flow hood measurements as all air balancing is performed by the optional air flow sensor built into each diffuser, and the centrally located Rickard software or Building Management System (BMS). After launching the Gorilla X HVLS fan range earlier this year, Fantech has now introduced a number of exciting new upgrades to meet the demands of most applications. As the international gateway to the Fiji islands, Nadi International Airport has been redeveloped through a major modernisation project that improves the traveler experience and enhances Fiji’s reputation as a major tourism destination. The correct ventilation solution for a given pool enclosure depends on a number of variables – including the pool surface area, the enclosure volume and whether or not the area is sealed from adjacent rooms. The Blue Rhino’s innovative design integrates a state-of-the-art Variable Speed Drive (VSD) that can be preconfigured to the client’s requirements. This helps reduce service costs, provides greater reliability and can save installation and commissioning time. The Direct Drive motor delivers improved energy efficiency and will almost always have more capacity to meet any additional air flow requirements by simply adjusting the VSD. In 2003, the NSW Government decided to transform the wharves into a new urban precinct known as Barangaroo. The $6 billion project separates the area into three sections for development. Barangaroo Reserve features 6 hectares of parkland planted with 75,000 Sydney natives to replicate the vegetation when inhabited by traditional owners, the Gadigal people. Barangaroo South and Central Barangaroo include a vibrant financial and commercial business hub, over 80 retail outlets, waterfront apartments, a dining precinct and a 6-star hotel. Fan manufacturers can choose to publish either ‘In-Duct’ or ‘Free-Field’ noise levels depending on where the noise is measured. The difference between the two terms is not well understood by many engineers and can lead to underestimation of noise levels. Fantech’s Ultra series, which also includes the recently released PowerLine in-line range, feature Ziehl-Abegg’s innovative Mixed-Flow impeller with high performance blade geometry. The Ultra series can achieve up to a staggering 30% additional air flow compared to the standard model of the same size, without generating higher noise levels. The search for better cancer treatments and cures is a step closer with the opening of the Victorian Comprehensive Cancer Centre (VCCC), a purpose-built centre-of-excellence for cancer research, treatment. Education and care located in Melbourne’s prestigious Parkville Biomedical Precinct. The $1 billion, 130,000-square-metre centre is home to cancer research, clinical services and educational facilities for Peter MacCallum Cancer Centre, Melbourne Health and the University of Melbourne. In 2013, an independent report highlighted that 70% of the #1.1 billion per annum productivity gains delivered by Australian Building Codes Board (ABCB) reforms were derived from the current performance-based code. This Technically Speaking article aims to summarise the steps required to submit a performance solution to the National Construction Code (NCC). A new and more flexible Variable Air Volume (VAV) system is helping consultants and contractors take the next step in HVAC system efficiency whilst having the potential to save on capital costs. More than just a building, Ngoolark is an award winning piece of architecture that connects buildings, students and the local Nyoongar community and changes the way in which those spaces are used. Built at Edith Cowan University, Joondalup campus, B34 was named Ngoolark, the Nyoongar word for the endangered white tailed black cockatoo, also referred to as Carnaby’s black cockatoo. Variable Geometry Variable Air Volume (VGVAV) diffusers are an effective method of controlling the thermal comfort of a room whilst reducing energy consumption. In this article we will look at good duct design principles and the use of equal friction and static regain duct design with VGVAV diffusers. Advanced impeller and housing design combine to make the Fantech Ultimate ceiling-mounted header box fan one of the quietest and most powerful in its class. A fully optimised inlet cone and centrifugal impeller maximise air pressure and helps produce strong, effi cient air fl ow performance. A new development at 132-172 Smith Street Collingwood, an inner suburb of Melbourne, is restoring the character of the old neighbourhood. Known as Smith&Co, the multipurpose site contains a mix of 238 apartments spread over two buildings, gardens and a commercial area containing office space, cafes and retail outlets. Variable Geometry Variable Air Volume (VGVAV) diffusers have been used for more than 40 years to effectively manage the air distribution system in a building. The functionality of early diffusers was limited in their capabilities, but in the past 10 years VGVAV diffusers have been transformed by the addition of advanced, modern electronics to help optimise indoor comfort. With the growth of apartment living across our major cities, ventilation in these living spaces continues to evolve. A new building at University of Technology, Sydney (UTS) has everyone talking. Designed by Pritzker Prize-winning architect Frank Gehry, the Dr Chau Chak Wing Building is part of the university’s $1.2 billion City Campus Master Plan to enhance student learning through collaborative thinking among students and staff. Access to electrical equipment manufactured overseas is now easier thanks to the internet and low cost express shipping. However the greater choice of products is only one criterion when deciding to make a purchase and contractors must also take into consideration quality and serviceability, customer support, product safety and compliance with Australian/New Zealand regulations. The WhisperJet Fan Kits combine the advanced technology of the mixed-flow in-line fan together with the high performance CC Series circular attenuators. The opening of Stage 1 of Echuca Regional Health’s redevelopment was a major milestone in the hospital’s 130-year history of delivering care to communities along the Murray River, bordering NSW & Victoria. A number of new types of low profile plastic duct have recently been released onto the Australian market. It is important for specifiers and installers to ensure the new product meets Australian standards and is compliant with the Building Code of Australia (BCA). Fantech has demonstrated its ongoing commitment to developing solutions for energy sustainable commercial buildings by expanding its Demand Control Ventilation (DCV) range of fans and control ancillaries. Jack Pirie touched a lot of lives as a mentor, an adviser and most importantly a great friend. With his passing on 15 July, 2014, Australia’s HVAC industry has lost one of its great leaders and innovators. To meet the ‘Deemed-to-Satisfy’ (DTS) requirements of the BCA, a car park ventilation system must comply with AS1668.2:2012 or an adequate system of permanent natural ventilation (Section F4.11) and AS/NZS1668.1:1998. The JetVent EC series (JIU-CPC EC) has been extended with standard, low height and high performance models now available. All three fans come with the option of a factory-fitted integrated smoke detection kit. Fantech has just introduced a new and unique prefabrication service to help save customer’s time and money when installing fans on site. materials perform differently when they operate at various stresses, temperatures, speeds and in corrosive environments. For this reason it is important to select the right fan impeller material for the application. Students and staff of the University of Adelaide are enjoying the results of a multi-level all weather learning hub they helped design. Located in the heart of the University’s North Terrace campus, Hub Central is an initial point of contact for students, offering a wide range of informal learning spaces. Sometimes it can be difficult to identify which type of fan impellar blade material is required for a given application. Typical blade materials supplied by Fantech include GRP (Glass Reinforced Polypropylene), Aluminium, Nylon and Anti-Static Plastic. Forty years ago Jack Pirie and Glen Harries met for a drink at a pub onevening. The meeting had a profound effect on both men’s lives as they began a journey to form a new company and start an unbreakable friendship that would see many highs and lows. To ensure a ventilation system functions in the built environment as it was intended in the design stages, it is crucial to know that the fan’s actual performance matches the catalogue data published by the manufacturer. Fantech now offers a quality, cost effective solution with BladeTec High Volume Low Speed (HVLS) fans made by DuctSox, an American company with over 30 years experience. The Sunshine Coast has received a retail boost with a substantial new investment by Harvey Norman. Known as the Maroochydore Homemaker Centre, it is the first new major bulky goods complex to be built in South East Queensland since 2009. Fantech’s ZOO (Zone Of Occupancy) Fan helps reduce energy costs, while maintaining a more comfortable, more productive environment for workers and customers at ground level. In the last four years Fantech has provided sponsored training for more than 108 operational staff nationwide to Certificate III and Certificate IV level in Competitive Manufacturing. A good ventilation system is vital in car parks. It must provide fresh air and ensure harmful pollutants such as carbon monoxide, nitrous oxides and various fumes from the vehicle’s fuels do not accumulate and reach toxic levels. Each VAV diffuser model is available in various configurations which are suitable for numerous applications or mounting positions. The electronically powered range comes in square, linear slot and bulkhead models; the thermally powered models come in square models only. Fantech has added two new models to the low noise, high efficiency TD Silent Series of mixed-flow fans.The revolutionary design of the TD Silent 250mm and 315mm models incorporate a number of new technologies that make them very quiet. Victoria’s largest bulky goods development is now open to the public. Located on a busy intersection in Melbourne’s southeast, the Springvale Homemaker Centre features Swedish furniture sensation IKEA and Australian retail giant Harvey Norman. Technically Speaking Want to reduce a fans energy consumption? In the first part of this technically speaking series we looked at how increased pressure drops caused by system effect influences power consumption. Smart technology is helping developers and architects to meet the growing demand for energy efficient HVAC solutions. Known as Demand Control Ventilation (DCV), the system increases the efficiency and effectiveness of the ventilation system, thereby reducing energy consumption and power bills. Melbournians have the opportunity to skate to the top of winter sports with a new world-class ice sports facility developed by ING Real Estate in Docklands. In the Fans by Fantech catalogue the ‘Installation Do’s and Don’ts’ section illustrates some of the common errors made when installing fans. Some are simply poor design whilst others are, what is called, ‘System Effect’. Air Design has just released a new, defined range of energy recovery units, developed and manufactured in Brisbane. Fans are a significant user of energy. The current best data suggests that fans are responsible for anywhere between 8% and 20% of the total worldwide electricity consumption and, of this total, 55% is consumed in the commercial sector.